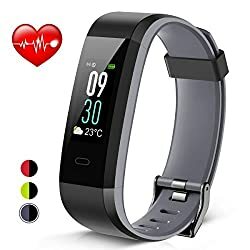 • Smart Activity Wristband - IP68 Waterproof Heart Rate Monitor Fitness Tracker..
• Supports Android 4.4 & above or iOS 7.0 & later..
• HD Color Screen with High Sensitive Touch Sensor..
• Bluetooth 4.0 Connection.. Smart Message Notification.. Call Alert.. Remote Camera Shooting..
• All-day Activity Tracking - Pedometer: Heart rate monitoring, sleep, steps, calorie, distance, pace, time duration..etc..
• Up to seven days working time.. About two hours charging time.. Rechargeable via USB charge..
• Strap Size: Suitable for 5.5" ~ 8.25" wrist.. Width: 0.65"..